How Many Reporters Does It Take to Cover Sarah Palin? Nico Hines and Matt Spence, two Washington-based reporters from the Times of London, were “flying north up I-95” on Tuesday afternoon, desperately trying to hold their position immediately behind Sarah Palin’s tour bus. “Palin bus tried its best to give us the slip out of Philly, but we’re on the case!” Spence wrote in one tweet, in which he posted a photo of the bus’ backside. Among those speeding up I-95 at that point: The Washington Post’s Rachel Weiner, Time magazine's Jay Newton-Small, and The Daily Beast’s Shushannah Walshe, who was riding shotgun with the Los Angeles Times’ Robin Abcarian. CNN's "CNN Express" bus, which held multiple employees, started its trip with Palin at the Rolling Thunder rally in Washington, D.C., and followed her to Gettysburg, Pa., for a broadcast of its network's John King, USA on Monday. ABC, CBS, The New York Times, Politico, and Real Clear Politics all had reporters out on the trail as well; in Philadelphia, two news helicopters flew overhead. Perhaps this was “manipulation of the news media,” as the Times’ Michael Shear wrote, but it certainly made for great sport. Whatever its purpose, Palin’s bus tour has succeeded in creating an Amazing Race-style competition among what the former vice presidential candidate calls the “lamestream” media. In Pennsylvania, Palin slipped out the back of her hotel, leaving reporters waiting on her empty bus out front. In New Jersey, Time’s Newton-Small lost Palin on Route 1 and went to Manhattan while the Post’s Weiner trailed Palin and Co. to a Hyatt in Jersey City. By dinnertime, the scrum was waiting outside of Trump Tower, before it followed Palin and Donald Trump to dinner at Famous Famiglia Pizza. And to what end? 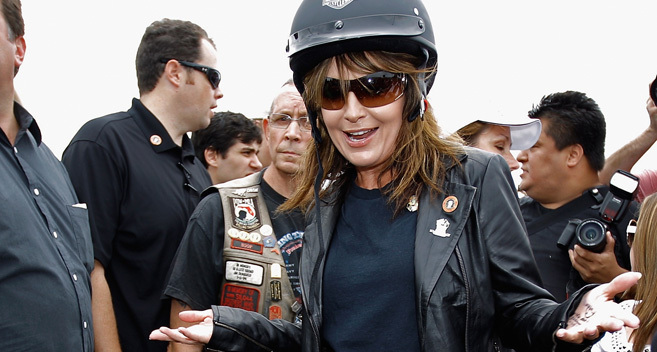 Most reports coming in on Tuesday were simply about Palin’s disregard for the media: “Sarah Palin Punks Press as Tour Begins Third Day” (ABC); “Palin Dismisses the Media, but They Come Back for More” (New York Times); “Palin to News Media: Catch Me If You Can” (CNN).